I can’t believe that this is only the end of our second day…we’ve done and learned so much already. Yesterday night after a long eleven hour flight from Philadelphia to Tel Aviv, we went to the Dar Ramot family in Neve Neeman for a delicious welcome dinner and discussion. The pita bread, hummus (pronounced hoomus), cheesy bread, chocolate, and cookies were all greatly appreciated after the meals provided by US Airways that most people slept through. After dinner and cookies, we got to hear the prospective of the conflict from an Israeli family with a son in the army. We learned about why they felt safer with the wall being built and their perspective on whether peace can be achieved. This conversation was a good lead into today’s events in touring Jerusalem. At 7:00 AM we all went down to breakfast where we were met with more delicious pita bread with all kinds of spreads and pastries. Full, and ready for the day, we left at 8:00 for a walking tour of the Old City (in 70-80 degree weather). 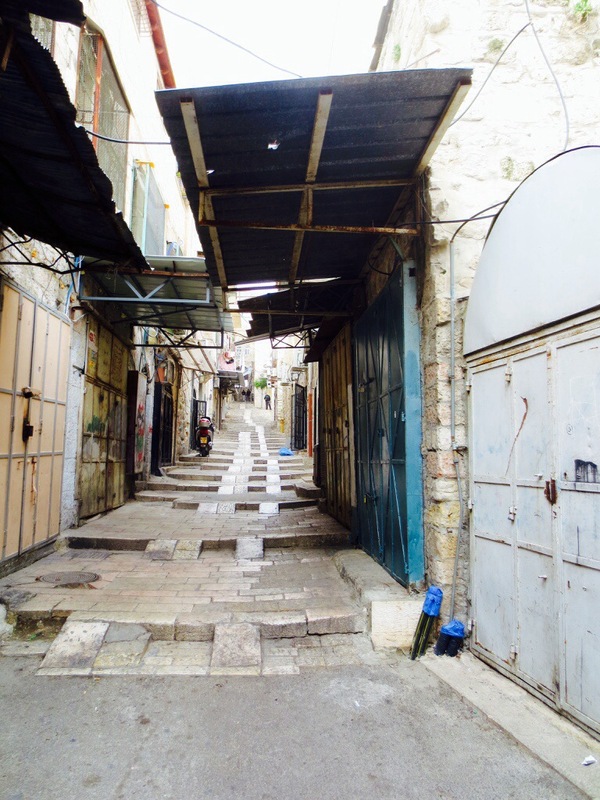 The narrow and labyrinth like streets in the Old City had merchants along the sides selling candy, fresh fruit, clothes, and jewelry. 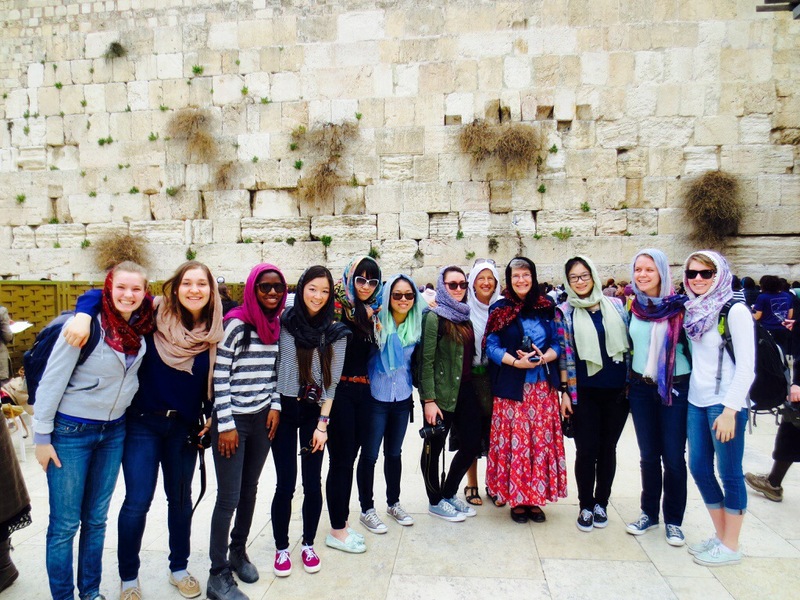 We were led by our tour guide to The Church of the Holy Seplechure and The Wailing Wall (The Western Wall). At The Wailing Wall, women and men are separated for prayer. After lunch we all boarded the bus for a bus tour of East and West Jerusalem. I learned more about the conflict during this four hour bus ride than I had known two days ago. Our tour guide, Jeff Halper is an Israeli Jew who belongs to the Israeli Commission Against Housing Demolitions gave us his perspective about the conflict, some of which was completely opposite of the Dar Ramot family. 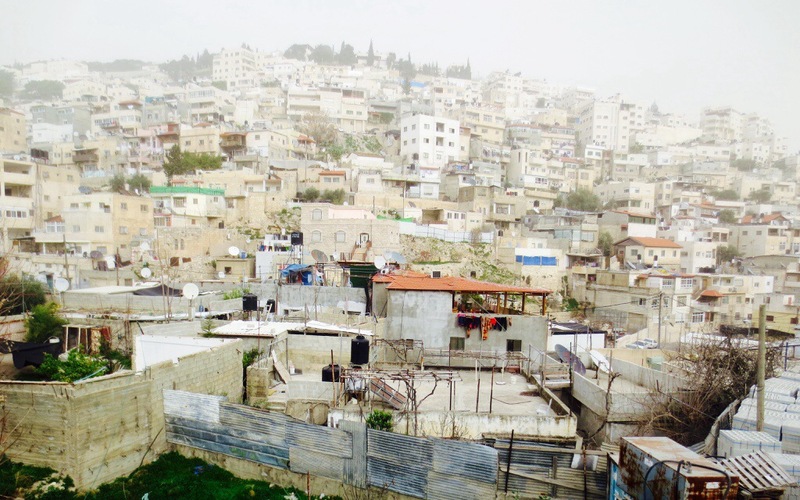 Driving around East Jerusalem in the city of Silwan, which has been changed to The City of David, where the Palestinians live opened our eyes to the stark difference between the living conditions of the Palestinians and Israelis. Jeff said, “This is where the sidewalk ends.” At this point on the street Israelis will not continue to walk, and the infrastructure is completely different. There are no sidewalks and trash litters the streets and yards everywhere since there is no trash collection. 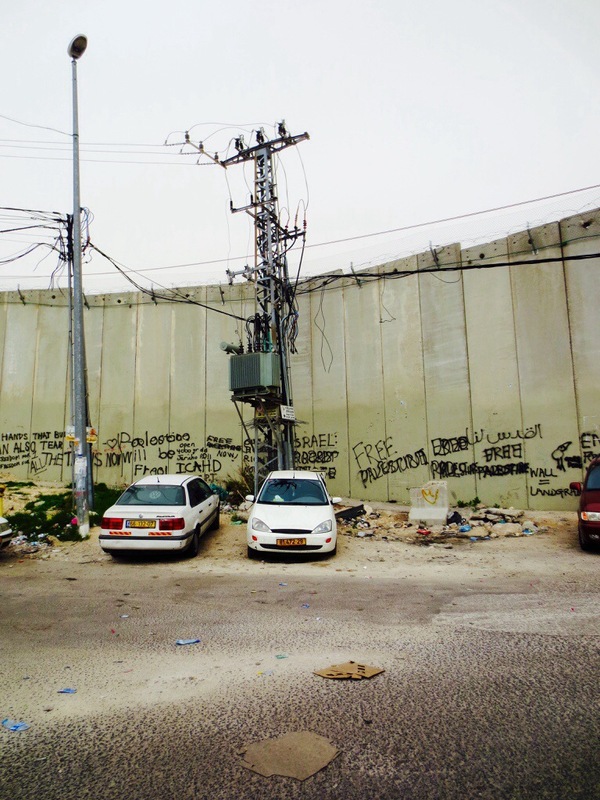 There were also demolished homes and barren land that is zoned for future Israeli Urban development. The illegal Palestinian homes are easily recognizable because they have black barrels on the roof to collect water since their water has been shut off. We continued to E1, an Israeli settlement nearby is vastly different than the Palestinian city less than a mile away. It is a comfort zone where Israeli’s can have a higher standard of living for lower costs in a depoliticized area. The biggest, and most shocking difference is that they have three Olympic sized pools and a giant man made lake for aesthetics while the Palestinians down the street cannot depend on having water for a shower. These two days have given us first hand interactions and experiences where we have heard truths from two sides of the complex conflict. While most of us are still jet-lagged we are ready for another early morning when we will be going to Zohar Badeshe Kibbutz Dalia.